A Memorial Day tradition began in my family in 1970. It was a tradition to never forget our loved one, my brother, Capt. 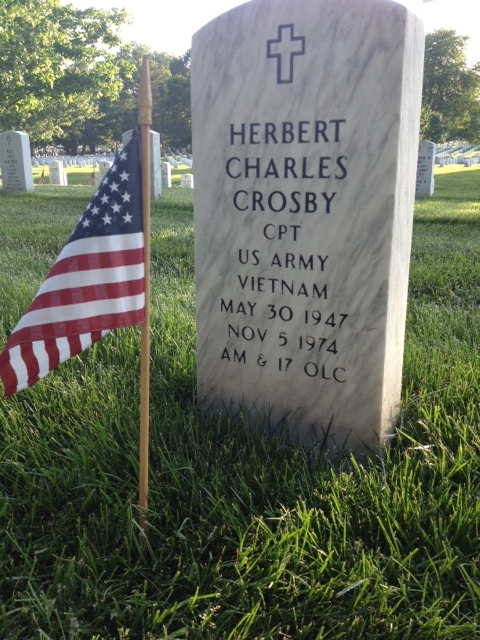 Herbert C. Crosby (Herby), who was listed Missing in Action (MIA) in Vietnam January 10, 1970. Since Herby was born on traditional Memorial Day, we thought it fitting to honor him with a simple, yet elegant red, white and blue flower arrangement adorned with American flags that would be placed in our local church annually for the Sunday services on Memorial Day weekend. It was our symbol to the community of faith, courage, and hope. We lived in a small town in south Georgia. Everyone knew everyone, so everyone knew of Herby. After 44 years this tradition has come to an end. It’s purpose was accomplished, the community never forgot and our faith and hope remained strong all those years. I remember so many times sitting in church looking so deep into those flowers, lost in thought of Herby. The flowers would brightened my heart because I knew they were for him. The end of our Memorial Day tradition is explained below in my reply to the email sent me from the church secretary inquiring about this year’s  flowers. My apologies for not getting back with you sooner. Last year while in Donalsonville for mom’s memorial service I stopped by Flower’s By Will to chat, take care of business and to thank Will for the many years he made not only the flower arrangement, but for his caring by taking those flowers to the Vietnam Memorial at the Courthouse for the Memorial Day ceremonies. Sadly, I let him know I wouldn’t be ordering the flowers for the church each Memorial Day anymore. It was probably the hardest decision I had to make at that time. I thought I had also sent a message to you but obviously I did not. I more likely thought that I would change my mind when I heard from you this year. When your email did arrive last week, I became stuck in the mud and just stared at your message. I so much want to place the flowers, yet know I can’t continue to do this. This is truly one of the hardest decisions because I feel I’m letting Mom, Dad, and Herby down by not keeping their memory alive on this so very special day for our family, Memorial Day. You know Herby was born on (traditional) Memorial Day (1947). Dad died on (observed) Memorial Day (1991). So needless to say, this holiday is very dear to me. Mom and Dad started placing the flowers on this particular Sunday because of Herby’s loss in 1970. They were determined to place them until Herby came home so people would remember, never forget him. Little did we know it would be 37 years later that he would come home, not as we hoped but in six teeth, two bone shards, and a dog tag. Yet, he came home. Our prayers were answered, again not in the way we hoped, but they were answered and I thank God for that every day. Our family was one of the lucky ones. We were blessed. We kept the flower tradition going even after Herby’s return home, yet now after 44 years and Mom’s death last year, it’s time to let someone else have the honor to place flowers on this very special day. I do wish I could keep the flowers tradition. I write this with tears in my eyes and ache in my heart. None of our family now lives in Donalsonville, yet our lives were molded into the depth and breath of this lovely small town, our home in our hearts. We have friends there who are as close, if not closer than family. I pray the church, and the community never forgets not only the sacrifice of my brother, but all the Vietnam casualties from Seminole County. The end of our Memorial Day tradition allows a new tradition for someone else. I know in my heart that my dad, mom and brother are loved and will never be forgotten. I decorate their spirits and their graves every day in my heart, and that’s what matters. I also have a beautiful red, white and blue flower arrangement adorned with American flags that is displayed every day in my home, in his and my father’s memory. A little sidebar note: My father insisted that the announcement of flowers in church bulletin always used the term “in honor of Capt. Herbert C Crosby” instead of “in memory of…” because we had no conclusive evidence of his death. He was missing. We were not going to give up hope he would come home. Until which time we had proof, Herby would be honored, and that was that. The announcement held those 37 years until after his remains were positively identified in 2006, at which time it was changed to “in memory of…”. This entry was posted in Capt. Crosby and tagged Capt. Crosby, church flowers, crosby herbert c crosby, Memorial Day, MIA, Vietnam MIA. Bookmark the permalink. Eloquent. And simply beautiful. I honor his memory today too, ML. God bless you. I work at the Academy of Natural Sciences in Philadelphia, PA. I found a POW Bracelet for Herbert C. Crosby at my work, probably a year ago at this point, and have had it in my desk ever since. I was finally cleaning out my desk today and found it and looked up his name. If anyone you know is missing their bracelet I would love to send it back to them or even to you. I wish I had looked him up sooner. I had originally asked around my work if it was anyone’s bracelet with no luck, but never thought to look up the name until now.